AURORA – Warriors will be on the run to start Homecoming Week on Sunday, October 1 at 10:00 a.m. at Waubonsie Valley High School. 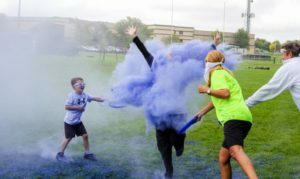 The Warriors on the Run 5K is a neon color run that enables participants to walk or run the 3.1 mile course. The cost is $25 per participant, that includes a t-shirt, a neon color packet, food, a raffle entry, and a sponsor goodie bag. Participants also have the opportunity to purchase sunglasses, bandanas and extra color packets at the event. All proceeds from the fundraiser will go toward the WVHS Parent Teacher Association and the WVHS Athletic Booster Club. To guarantee a t-shirt and color packet, runners must register by September 15. For more information or to register online, visit warriorsontherun.com or take a look at the 2017 Race Packet.